Stir fork-crushed, cooked broad beans through with finely-chopped spring onions, mint leaves, olive oil and seasoning. Serve with a roasted halibut fillet wrapped in Parma ham. Sauté three chopped leeks with 25g butter. Add a splash of white wine, 200g baby broad beans and enough vegetable stock to cover it all. Simmer for 10-15 minutes. Mix with a handheld blender, splash in single cream and season. Keep chilled. Create a salad of carrots, spring onions, radishes, celery and baby broad beans and pour over a Japanese-style dressing, made from a crushed garlic clove and a tablespoon each of white miso paste, mirin, rice vinegar, soy sauce and sesame oil. Serve with teriyaki beef. Slice and de-seed the cucumber and place in a medium-sized bowl. Add sliced radishes and spring onions, a handful of mint and pea shoots. Pour the olive oil and lemon juice over it and add seasoning. 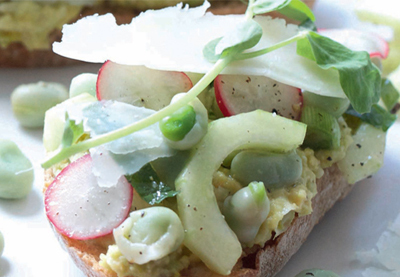 To assemble the tartines, toast the sourdough bread and spread generously with the broad-bean hummus. Top with the dressed salad and add shavings of Pecorino.